Giving you the time to concentrate on your farm. Let us do the hard yards in the market place. Choose whether you would like a Forward or Post Harvest Contract. We have fixed grade, multi grade and even acre contracts available for some commodities. If you need to learn more about contracts feel free to request an “on farm” appointment and learn your options over a cup of tea. Based on the market intelligence you have gathered, determine an acceptable sell price. Let us keep your “intention to sell” on record so we can contact you when the market is close to your “order value”. Full members get emailed market updates that include; Morning comments to start the day with. Afternoon prices and domestic commentary. SMS alerts when the market moves favourably. Commodity specific analysis and other important updates that will help you understand the markets. Get on with the farming. We handle everything involved in the sale, all you need to do is relax and wait for your payment to be transferred. Between 8am and 10am weekdays, a simple email report covering overnight markets from around the world, domestic activity and market seniment is sent. It also includes a summary of the weather and settlement prices for overseas futures markets. A text message will be sent if prices spike higher or approach assumed trigger values. Texts are often sent daily during the harvest period. At crucial times throughout the growing season, crop tour updates will be produced. This is often in the form of a YouTube video. A price sheet with a record of each day’s prices for the past week will be emailed. The sheet will also include the morning comments for each day of the prior week. This is free to producers who have sold or intend to sell to Dolbel Consulting. Mid afternoon, an email is sent that summarises the best public bids Dolbel Consulting has seen during the day and comments about the domestic market. Periodically, commodity specific updates will be emailed outlining recent trends, crop conditions and any obvious impact these may have on the market. 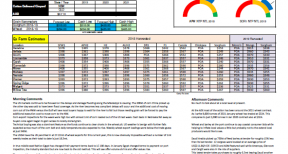 International, national and regional supply and demand estimates from leading analysts and Dolbel Consutling. Sell grain through Dolbel Consulting and receive a low $2.00 per tonne (+GST) brokerage fee; the same rate as it was in 1989, 2000 and 2012. This rate is available to anybody. Subscriptions are an attempt to keep the brokerage as low as possible for the subscriber. Producers who have sold grain with Dolbel Consulting as your broker for the above brokerage fee will be supplied with a FREE weekly market wrap containing reports on overnight markets from around the world, domestic activity and market sentiment, emailed directly to you. 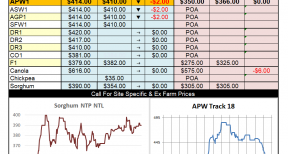 Members receive daily prices & commentary, text messaged price alerts, special market updates, Supply & Demand tables. 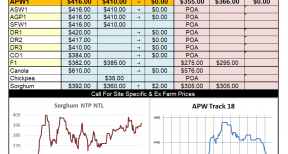 plus crop tour reports. Annual fee must be paid in advance for each year. Monthly fee is charged in quarterly installments only, paid in advance. You can opt out at any time after a quarter if you are not a seller.